Marble looks magnificent and has the power to make the simplest of rooms look absolutely royal owing to its texture, shine and color. Marble, though a high maintenance stone, is a timeless and ever trending choice among all the home owners and interior designers. Marble, a sedimentary rock, that has characteristic veins formed by the deposition of minerals and is hardened under natural pressure, comes in a lot of colors and varieties. Italian marble is considered one of the finest, and there are two most popular types of Italian marbles : Carrara and Calacatta. In this ideabook, you will see how to identify the two Italian white marble, and appreciate the differences between Carrara and Calacatta marbles. Ready to discover? Carrara marble is a white Italian marble that is slightly grayish in color. A typical characteristic of Carrara marble is the soft feather grains that it exhibits. The grains of the marble make give it the unique look it possesses. All the marble slabs drawn from one block will have the same grains and when the experts lay them on the flooring in the right way, the grains join and make a beautiful design, unique for a block of marble. Hence no two floors can have the same design until they are covererd by marble slabs from the same rock. Calacutta marble is another type of Italian marble, mostly found in the Carrara (yes, do not be confused) region in Italy. Calacatta marble is whiter and smoother than Carrara and has more darker and dramatic veins which are thick and generally run in a mesh on the entire surface, as seen in this picture. You could use marble on the counter top, and match the walls with marble effect wallpaper too for a great looking kitchen. In marble there is generally a rule of thumb to remember, the whiter the marble the more expensive it is. Calacatta marble is whiter as compared to Carrara marble and is much rare in occurrence as opposed to the Carrara marble. 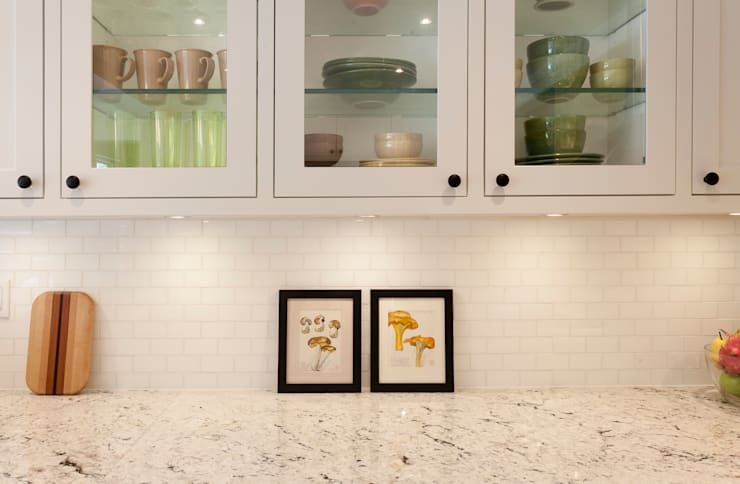 The cost of Carrara marble would range anywhere between $40 per square feet to $100 per square feet unfinished, depending on the quality, availability and graining. Calacatta marble costs more than Carrara marble, and starts at somewhere near $100 and may cost as high as $250 per square feet unfinished. The high cost of calacatta marble is mostly because of its rarity and low availability, which makes it more precious and is considered a luxury marble. See the impact of a luxurious marble on the floor. As we mentioned earlier, marble has the power of adding glamour to a room. 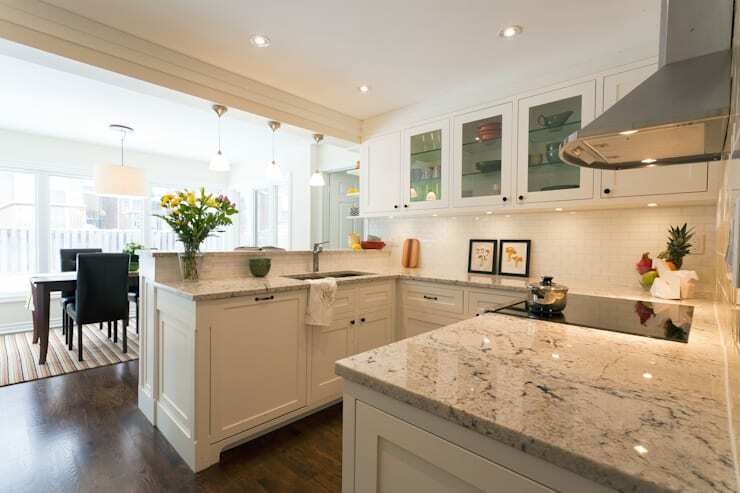 See this kitchen, with the counter top covered in Carrara marble, makes it look sparkling and luxurious. 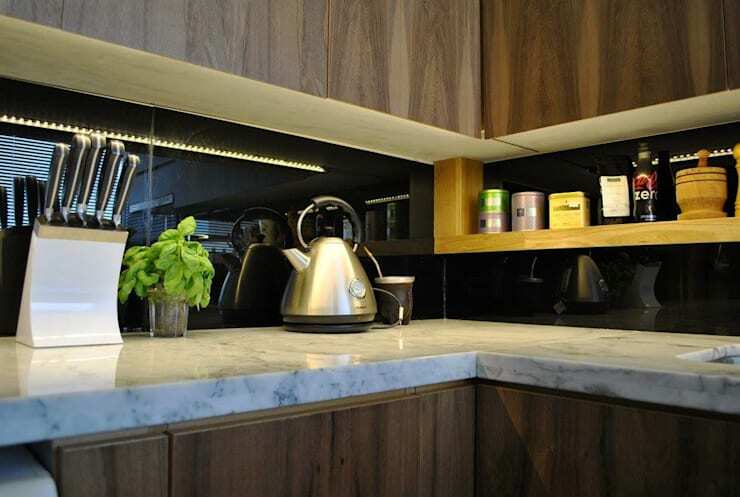 Marble is a great way to make the room look illuminated and spacious, owing to its light color and shiny surface. However with time the shine depletes, but can easily be restored by some polishing. Similarly, Calacatta marble looks great on any surface, and you should go for it for the great looking veins and dramatic contrast i.e. if your budget allows. 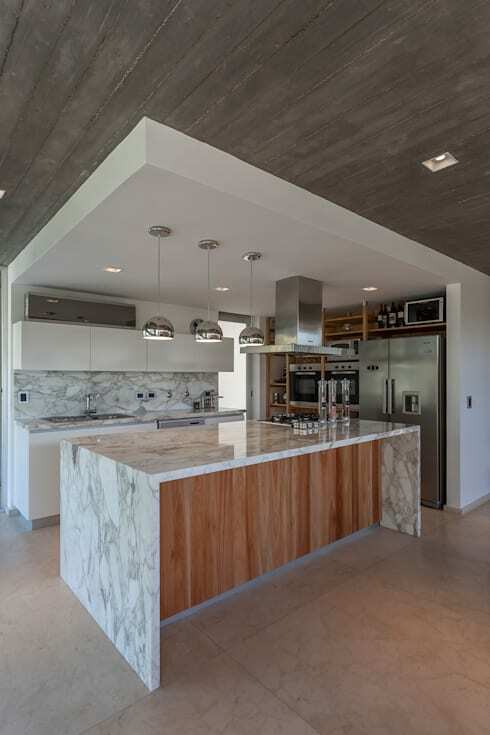 See these 20 kitchens with marble and granite counter tops. 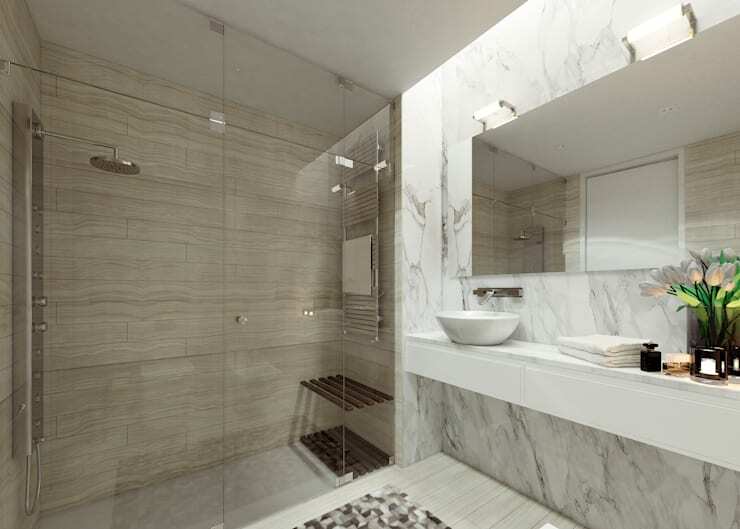 Though bathroom would not be the place, where you would usually want to use the super expensive Calacatta marble, however it is sure to light up the bathroom too. Always remember that marble needs a lot of maintenance, and since it is porous in nature, it tends to absorb anything that falls on its surface. Clean the marble bathroom with soap and water, and do not use any acidic cleaning agents on the marble. 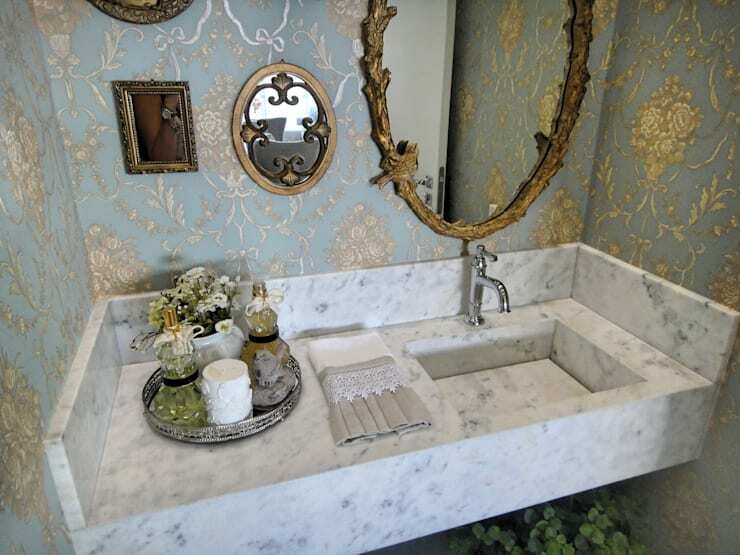 This bathroom counter top has been made from Carrara marble, a fine and subtle grained, slightly grayish Italian marble that looks elegant and lustrous. Having said that, a marble wash basin needs to be kept dry, and needs to be wiped after every use, in order to maintain the color, or else within in short span of time, with constant absorption of minerals in water, it will appear dull and dark as compared to the rest of the counter. Here are some great ideas to decorate your bathroom. There is a variety in Carrara and Calacatta marbles, which has some golden veins running through it. 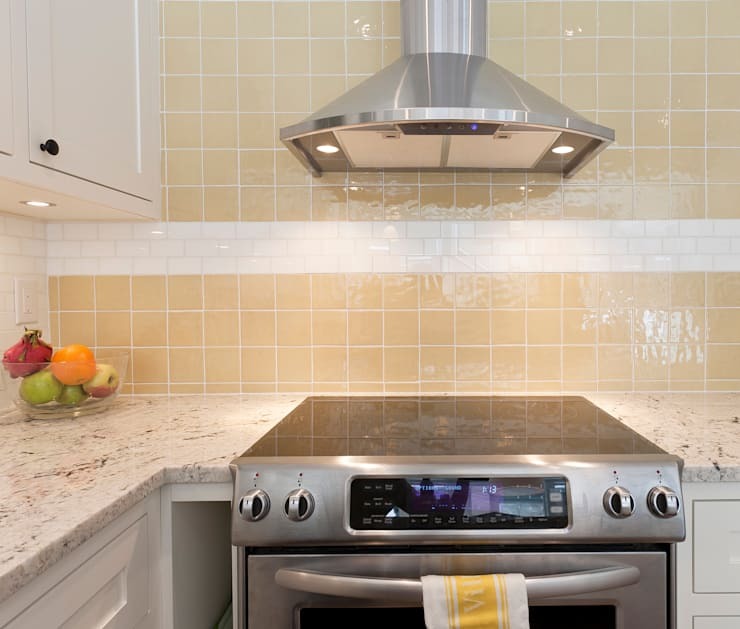 It adds a little yellow tone to the white marble, and is especially shiny in the Calacatta marble. This gold range in marble is a little more pricey as compared to the normal one, and goes beautifully on dining table tops, center tables, and other places in the living room or hallways. The Carrara gold marble complements beige color brilliantly with its soft feathery grains in gold. 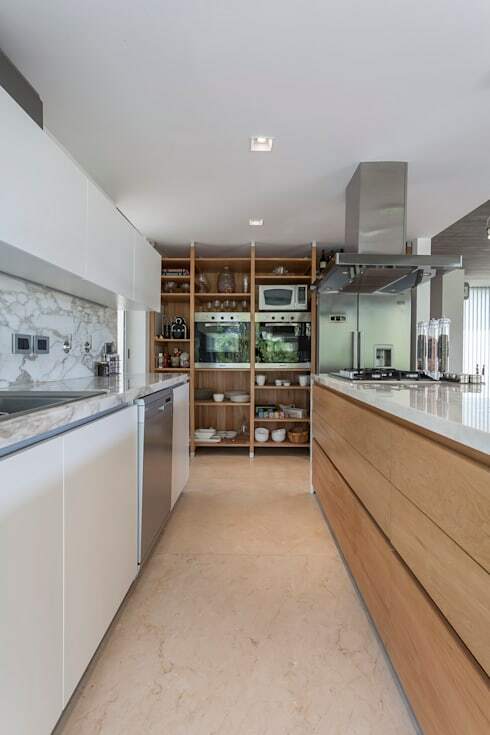 See this kitchen island looking absolutely regal with the marble top. There is no significant difference between Carrara and Calacatta in terms of hardness, porosity or density. The amount of maintenance required is also the same. The major difference lies in the color of the two marbles. While Cararra marble is grayish, Calacatta marble is white, and that reflects the purity of the marble. This purity is what makes it expensive and more sought after. Hope you are able to identify the Carrara and Calacatta marbles, when you look at them now ! Leave aside the cost, and let us know which marble you liked more, Carrara or Calacatta?